Art Number 23 is a London-based organisation, mainly responsible for curating art exhibitions inside the U.K. and overseas. The aim is to create opportunities in order to encourage and support artists from all over the world to exhibit and promote their work. 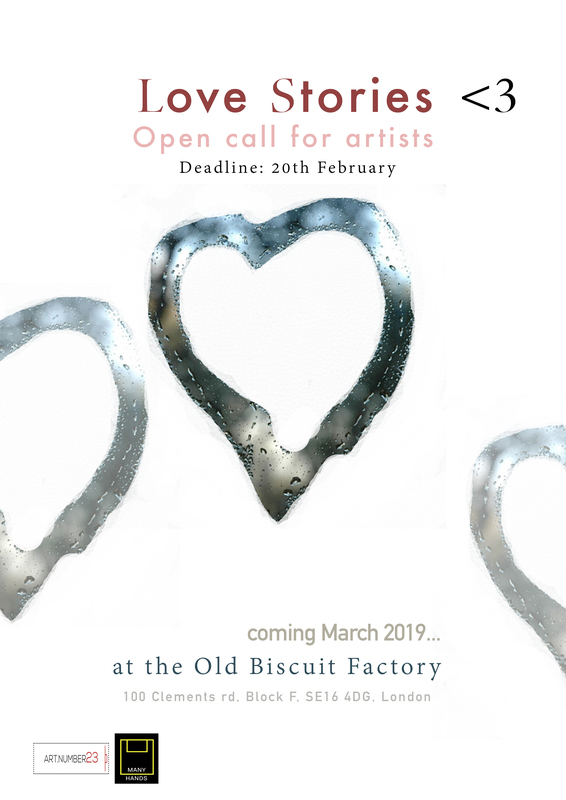 We are currently accepting your submissions for our upcoming exhibition at the Old Biscuit Factory! The theme relates to love stories that have been depicted through art. Any types of stories about relationships, the past, the future; sad stories, happy stories; and everything else that explores and presents aspects of this part of our lives can be accepted. Artists from all countries and of all mediums and styles are welcome to apply; including painters, sculptors, video artists, textile artists, performers and more. Please note that we will be selecting the successful artists before the end of the deadline so we would suggest you not to wait until then to submit your application. You can find all the information on how to apply below. We look forward to your correspondence! Catalogues (hard copies) - the catalogues include a short bio/artist statement, image of the artists' works, their email address and their website. Artists who live abroad, outside London or who are unable to attend, will receive a copy of the catalogue via post. e-Catalogues - a digital version of the catalogue with hyperlinks to each artist's website. Those catalogues are easy to share, and they will be there for you to order one, in case you loose your original copy of the catalogue. See our e-Catalogues here. Storage of the artworks for up to one week after the end of the show. We can also post your work back to you (the artists are responsible for the postage expenses). Promotion of the exhibition and the participants to our mailing list (more than 1500 subscribers) and on social media. Documentation of the artists' work in the venue.